We are committed to continuously improving access to our goods and services by individuals with disabilities. This website is currently being updated to enhance the usability and experience for persons with disabilities. If you are unable to use any aspect of this website because of a disability, please call 617.423.6165 and we will provide you with prompt personalized assistance. 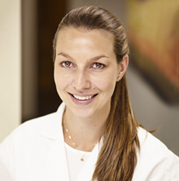 Dr. Castellucci, a graduate from Tufts University School of Dental Medicine, comes from a family of dentists. Her father is a periodontist, and her two uncles are also dental specialists. From a young age, she was exposed to their passion for dentistry and dedication to the highest standards of care, and this ultimately led her to choose the vocation as well. She loves the attention to detail required in dentistry and its mix of aesthetics, function, and biology. Dr. Castellucci has a simple philosophy, which is to treat every patient with compassion, professionalism, and a gentle touch. She is committed to providing comprehensive, quality dental care while making sure patients are informed and comfortable with their treatment plan. A native of Wellesley, MA, Dr. Castellucci now lives in Boston with her husband and spends her free time cooking, playing and watching soccer, and spending time with family and friends. She also loves traveling, often visiting family in South Africa, and enjoys spending summer weekends on Martha’s Vineyard. Dr. Castellucci is a member of the American Dental Association (ADA) and the American Student Dental Association (ASDA). Here at Osorio Dental Group we work diligently to protect our patient’s rights and privacy. Requesting an appointment via our Internet portal is considered part of what HIPAA has identified as electronically protected information (ePHI). Unfortunately, despite the best efforts we make or take, there are people or entities that may attempt to intercept the data you transmit to us. By checking the box, and electronically making an appointment, you understand that you are making an appointment over the internet and that Osorio Dental Group will keep this information confidential but cannot guarantee that others, outside of our practice, may not illegally intercept this communication. As a result of continuing, you are sending this transmission and accepting the inherent risk(s) associated with making this request for an appointment. As an alternative, you are always welcome to contact our office via telephone to schedule your appointment.